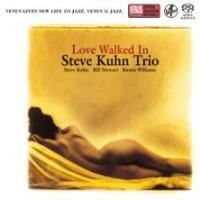 Veteran pianist Steve Kuhn found new heights in piano trio projects with Venus Records. Love Walked In features a fantastic rhythm section of Buster Williams and Bill Stewart, and contains many highlights including the bluesy and groovy "Sunny," the thrilling "No Problem" and the daring "Autumn Leaves." Recorded at Clinton Studio, New York, on September 11 and 12, 1998. Gate-fold paper sleeve edition. Single Layer SACD.